Since its shot to popularity in 2009, Farmville is considered as one of the most highly successful Facebook game (and is currently still within the list of top 100 most popular Facebook games). In fact, there had been a report by the New York Times in 2009 that stated that Farmville ‘farmers’ outnumbered actual farmers in the US by a ratio of more than 60 to 1! Its appeal to various people in all stages of life is very lasting… perhaps due to its enjoyable gameplay, the social aspect of the game as well as its extensive content. 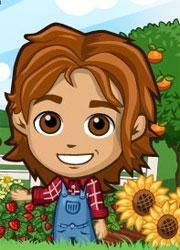 So, come and join in the craze called Farmville and start building up your farm today! 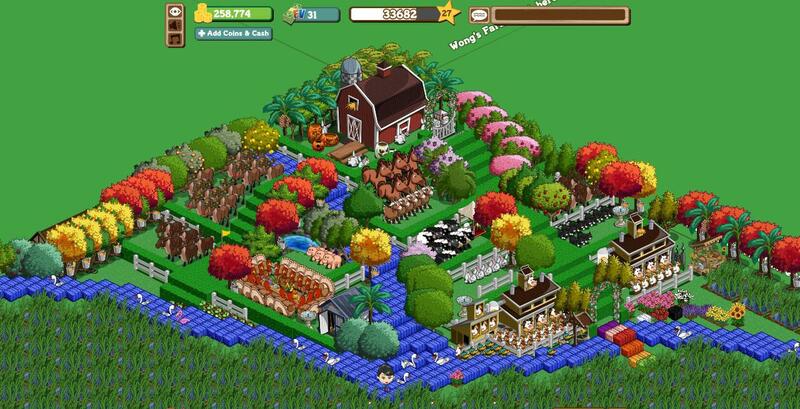 Like any farming game, Farmville allows you to unleash your inner farmer and create your own farming empire! You will need to plow the field, plant crops and harvest them to earn your farm some coins, the occasional bushels (which will be used later for crafting) as well as some mastery points. There are a huge variety of crops in this game, such as wheat, strawberries, rice, peanuts and also including some of the more unique (and perhaps outlandish) ones, like Apple in a Box, Boggart Bulb, Bubbles, Crystals and Broken Hearts. Each crop has its own set growing period that ranges from a few minutes to a few days. Once the growing period is over, the crops will be ready for harvest, but you shouldn’t wait too long! If you left your harvestable crops unattended for too long, your crops will wither and die. Thankfully, if this happens, you can beg your friends to help you revive your crops or you could purchase Farm Cash (real money currency) and buy Unwither to do so. All crops (along with trees and animals) also have 3 stages of mastery and you’ll need to harvest a lot of (around in the ‘thousands’ range) a specific crop in order to earn a mastery for it. In other words, masteries can be a really tough nut to crack. However, when you managed to reach the third mastery for a particular crop, you will earn a sign for that crop, which you can then place on your farm or on your bloom billboard to brag about your achievement in the game to your fellow visiting neighbors! In the later levels, you may realize that you need more space for all your crops. You can easily add farming plots by spending a mere 15 coins per plot. In fact, if you want to optimize your farm land, you can even consider filling as many spaces as you can on your land with plots. You can expand your farm land for a price as well! As your farm becomes bigger, you may want to consider getting tractors, seeders and harvesters to plow, seed and harvest (respectively) your crops more rapidly. If you can afford it, you could even buy a combine machine which can plow, seed and harvest your 20 plots on your farm for you! These machines require fuel to function though and fuel can sometimes be in short supply. Besides crops, you can grow trees on your farm too! Trees can be bought, fully grown, from the shop for coins. However, for mystery seedlings that you can get from your neighbors as gifts, you’ll need watering cans to grow it into an adult tree first. Watering cans can be obtained from neighbors or from the cash shop. As your farm grows, you will build up a wild array of trees which can then be grouped into orchards for faster harvesting and a chance to get a mystery seedling. Orchards can also be supplemented with groves to boost the harvest of the trees as well as the mastery points earned per tree. 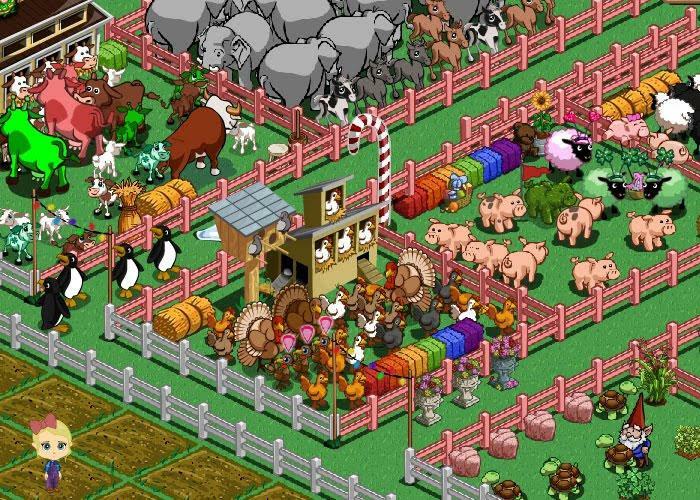 In Farmville, you can even raise a variety of livestock, such as chickens, cows and goats, to obtain milk, wool, eggs or other assorted animal produce, which you can later sell for cash! As you collect more and more assorted farm animals, you may realized that keeping these animals in buildings, like cow pastures or pig pens, do not only make your farm looks tidier, it made collecting animal produce much easier as well! Besides resource-producing farm animals, you are allowed to keep adorable pets too in Farmville. You will start off with the baby version of the pet you’ve selected to buy. By feeding it kibble for 14 days in a row, you will be able to grow your pet into adulthood and it will stay around in your farm permanently. Pets are not only eye-candies in Farmville, these canines can also perform cool tricks and help out around the farm! Remember those bushels you’ve collected from your harvested crops? Well, you can use them to craft a variety of products, including food stuff, such as apple cider, baked beans and bao, and items, like beaded wristlet, assorted candles and bib. Most of your crafted goods will be produced in the craftshop, the bakery and the winery. Unlike crop mastery, crafting masteries have a total of 5 stars each. This means that you’ll need to craft a lot more items before you can complete the mastery of a recipe! 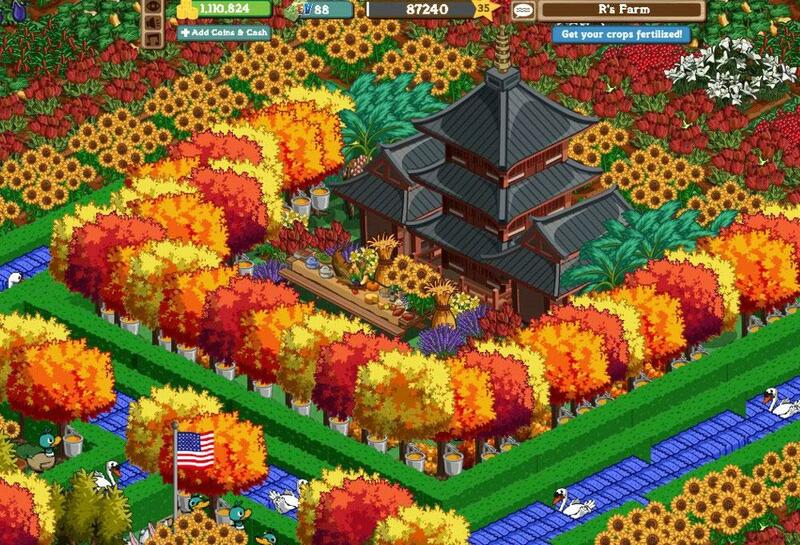 In Farmville, you have to option to decorate your farm with plenty of beautifully designed and sometimes themed items, for instance, enchanted waterfall, a summer pool house, fishing hole, hot spring and even your very own shipwreck. Although there are décor that will only cost you coins, quite a number of the decorative structures will require materials that you can only get from your neighbors or through paying Farm Cash. After getting your farm to look good, you should give your farmer a good makeover so he or she looks good as well! There is a huge list of items that you can buy for your farmer, including outfits and accessories, hairstyle and color, as well as facial features. Mix and match these items, so your farmer will look unique! Being a social game, the social aspect of Farmville is very important if you plan to advance further into the game! You’ll definitely have a terrible time trying to play this game alone. First of all, you will need your neighbors if you want to build any buildings in the game since all of the materials required can be gifted by your neighbors (unless you want to sink a hefty amount of real life cash into the game). Furthermore, there’s also a trading feature in Farmville that allows you to buy or sell your bushels and other products with your friends to earn coins, experience points and crop master much faster! So, with more dedicated Farmville-playing friends, a lot of the things in the game can be made much easier and can be completed more rapidly. Thankfully, Zynga, the developing company behind Farmville, understands that randomly adding friends on Facebook for the game can be rather troublesome at times. Thus, the company rolled out an update allowing players to add Farmville neighbors without needing to actually ‘friend’ them on Facebook. There are more than, wait for it, 38.5 million likes on the official Farmville Facebook fan page! That’s more than half of the popularity that the simpler match-3 game, Candy Crush Saga has garnered! Furthermore, the community in this game is very close and friendly. For instance, they won’t block you or ignore your Farmville requests for help and will be glad to lend you a hand! There are plenty of minor communities that has grown from the main community, such as the‘add me’ groups as well as gifting rings for Farmville players, on Facebook too. 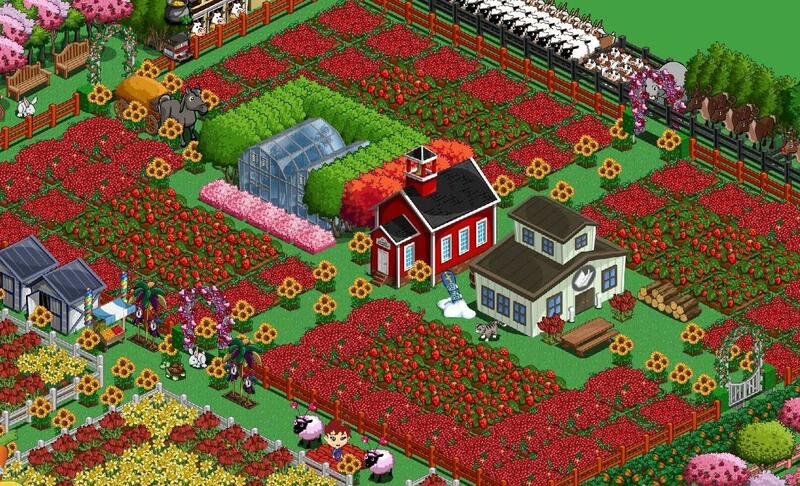 Not to mention, Zynga keeps to a strict schedule to release new themed farms or items every 6 weeks. This allows them to engage their players on an almost constant basis with new features and events. 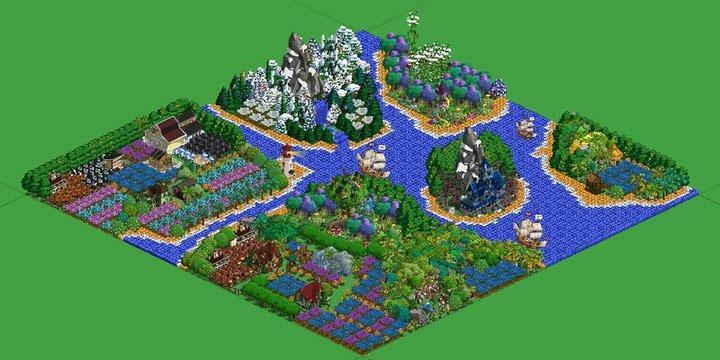 Farmville has 2.5D graphics that are colorful and very detailed eye-candies for sure. The crops and fruits harvested look so succulent and juicy while the pastries and other baked goods look so delicious! Even though you know that these aren’t real, you probably be licking your lips in anticipation as you’re collecting them from your farm or buildings. The animals are also so adorable, particularly when they do this little jig after you feed them! The game has a selection of very catchy country-like tunes played on the guitar and piano accompanied by the sounds of nature. The music gives the game a very relaxing feeling, overall. The variety of music in Farmville is astounding for a ‘mere’ Facebook game. No wonder Farmville players love to spend so much time with their farm! Being one of the original social farming games on Facebook, Farmville is still going strong despite being more than 5 years of age! It provides a great place and atmosphere for people to enjoy virtual farming as well as to learn about how to manage a farm. 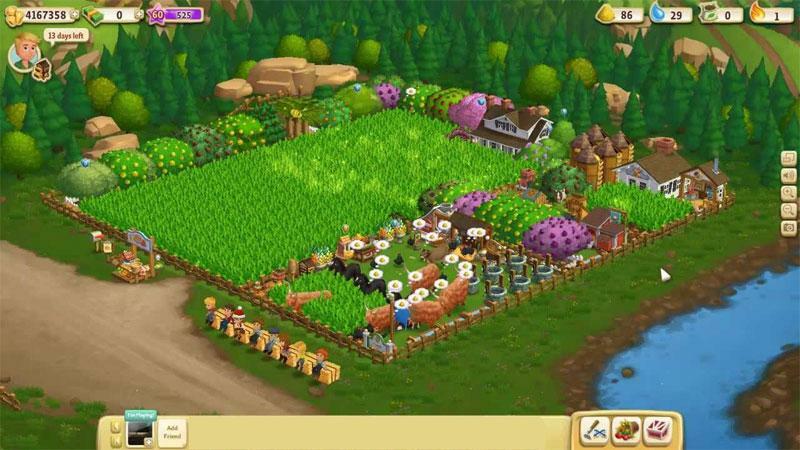 Being a social game, the game focuses heavily on getting in-game materials from neighbors, resulting in the need for having dedicated Farmville players as Facebook friends. The gameplay may be repetitive at times (the cycle of plow, plant and harvest), but the game offers a huge load of events and quests that will help you break the monotony of virtual farming. If farming games are your kind of thing, then you should already have Farmville in your Facebook game library, especially considering that it is one of the classic Facebook farming games… What do you mean ‘not yet’? Well, go get it today! Be the First to Post a Review!